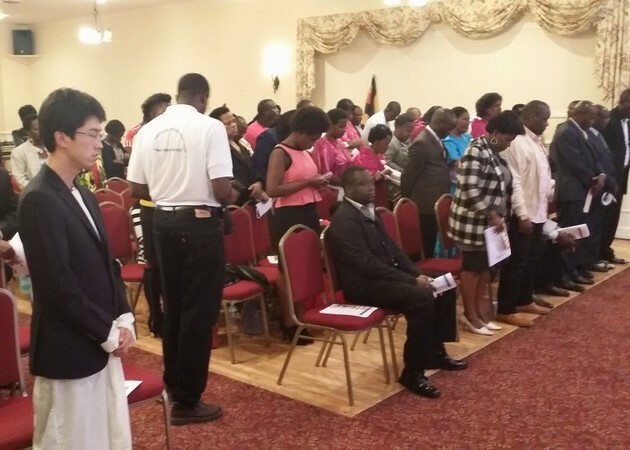 On Saturday October 11th 2014 the Ugandan community in Boston commemorated their 52nd Independence day celebrations in Waltham. 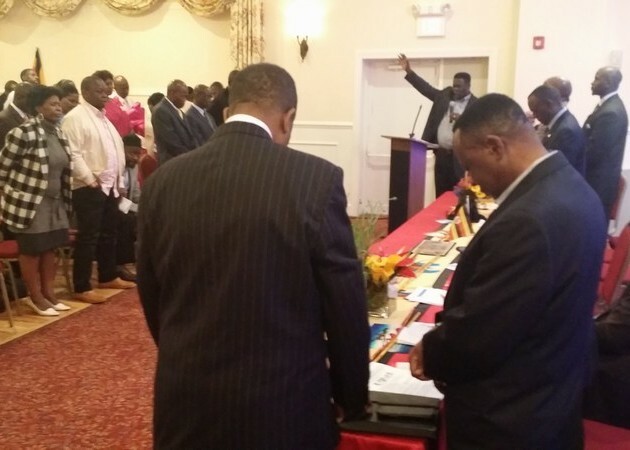 The event organised by Radio Uganda Boston together with Multi Professional Consultants started off with an inter-denominational prayer service. 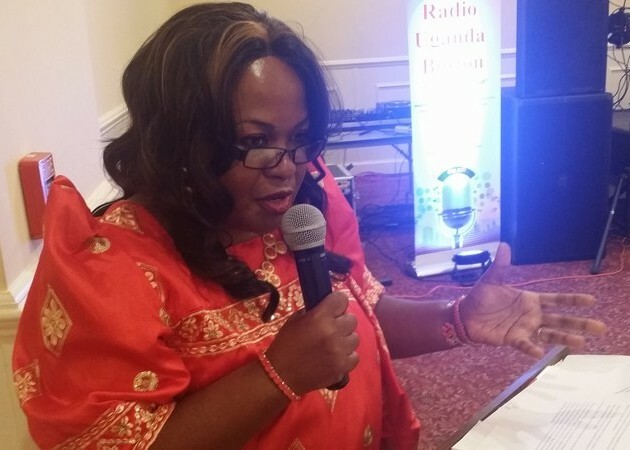 The Chief guest was Uganda’s Deputy Ambassador to the United Nations — Ambassador Kintu Nyago while the keynote speech on ‘The Power of the Ugandan Diaspora in the Uganda of Today’ was delivered by Mrs. Peace Sseninde a renown Human Resource consultant based in New England. 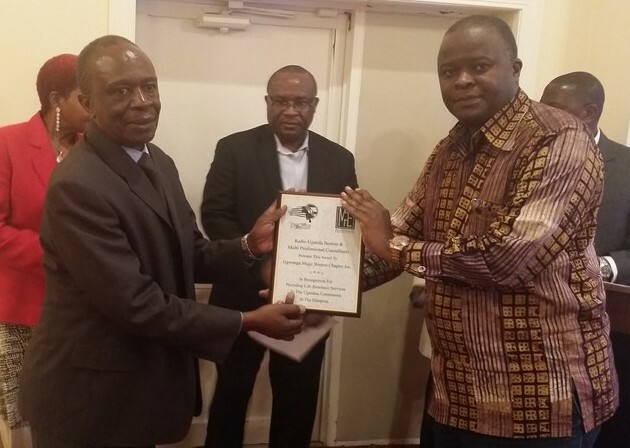 The event also saw Gwange Mujje Boston recognized for the most outstanding achievement of 2014 after successfully introducing a community life insurance policy that is now helping to repatriate remains of community members who die in the Diaspora. Below is summary of some of the highlights presented by Mrs Peace Sseninde and a few of the images from the prayer service held in Boston. 6. of which the group’s consciousness and solidarity are “importantly defined” by this continuing relationship with the homeland. I will boil down the meaning of Ugandan Diaspora to mean folks that are away from home, Uganda, for an extended period of time yet maintain the love and commitment to see the country boldly move forward, whether it be on the granular level of supporting friends and family at home, or from the more macro view of supporting land and country. Now that we have an understanding of what it means to all of us Ugandans in the Diaspora, let us switch gears to understand how much power all of us here today have to effect change in the Uganda of today. With a per capita income of US$506 [Compare to Ghana $1,850; Kenya $994; South Africa $6,618; Nigeria $3,006; Tanzania $695], Uganda remains a relatively poor country and far from the middle income status of about $ 3,500 (2009) it aspires to achieve in one generation. Although Uganda is set to meet the first related Millennium Development Goal (MDG) set by the United Nations to eradicate extreme poverty and hunger, a vast majority of its non-poor population are classified as vulnerable. Let’s explore how folks in the diaspora can help alleviate poverty in Uganda. Before I go any further, it is necessary for all of us to understand the basics of how an economy grows. Economies grow by creating jobs. Jobs are created by private citizens establishing successful businesses. Successful businesses are created from national savings. Savers put their money in banks and investors borrow or savers sometimes invest (or lend) their money directly. Developed economies have accumulated domestic savings over centuries to invest in domestic businesses that enable them to create jobs and; this is why most of us find ourselves here! Jobs. Developing countries such as Uganda don’t have sufficient domestic savings therefore they cannot create enough businesses to create jobs at cheap enough costs of money. Because the domestic savings rates are low, the interest rates, the cost of money of borrowed funds from banks and other such financial institutions is high. A healthy portion of Ugandan households is currently buffering their savings needs with money received from abroad, from family and friends, the Diaspora, living overseas. • Foreign overseas development assistance (ODA) from developed countries e.g. USAID (from USA), CIDA (from Canada), and others; this is also commonly known as foreign aid. Ranking of Remittances: In 2013, like many developing countries, Uganda’s ‘… worker’s remittances [at US$910 million] exceeded estimated ODA at US $677 million and private debt and portfolio equity (i.e. foreign investors) estimated at US$ 278 million.’ (Egesa, 2014). The economic power of our diaspora is clearly demonstrated at the macroeconomic level by this comparative capital flow data. The $910 million received in 2013 remittances from abroad was 4.3% of Uganda’s GDP. The remittances have played a major role in the economic development of the country by making up for domestic savings. The money transferred to Uganda daily is injected back into the economy by way of increasing individuals’ purchasing power to buy goods and services and also to invest in the country as will be demonstrated below. • Ugandan nationals currently residing in Uganda according to the Census is about 34 million. 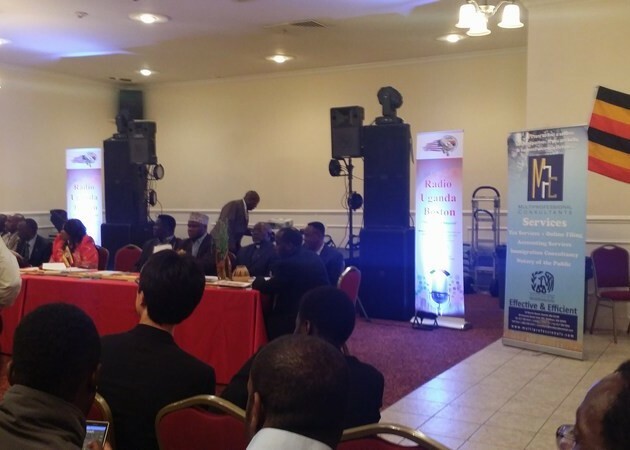 • Ugandan nationals currently residing in the Diaspora is about 650,000. • About 1.9% of Ugandans are residing in the Diaspora, while contributing 4.3% to Uganda’s GDP. • 43.1% of remitters were based in Africa, 25.9% Europe, and 20.6% North America (see Figure 1 below). • 35.1% was sent by a brother/sister abroad, 16.5% by a parent, 11.6% spouse, 8.3% daughter/son, 6.4% friend, and 22.0% other. • On an individual basis, Australasia diaspora have the highest average remittance ($1,197), seconded by the USA at $1,122. The Middle East diaspora have the lowest remittances ($829) with Europe ($924) second from blow. It is surprising that Africa (at $1,060), which is expected to have the lowest wages, ranks higher than Europe ($924) on individual average remittance. •The dollars sent by region closely matched the proportion of remitters by region with the exception of the North America (the US & Canada) region; although only 5% of the diaspora reside in this region, they contribute a significant 21% of remittances to Uganda. According to World Bank data, Uganda expects to receive $1,001 million in remittances in 2014. Chart 1 below shows a persistent growth of remittances since 2006 at smoothed annual rate of 12%. Utilization: An overwhelming proportion (about 70%) of the remittances is used for household expenditures and education (Egesa 2014, UBOS/Bank of Uganda 2012)). • Education: Uganda is also off-track on the MDGs related to universal primary education despite reforms. Learning outcomes have been disappointing especially in reading and mathematics which are lower for Ugandan students than for Kenyan and Tanzanian students. However, gender equality prevails in school enrollment with little or no difference between net primary or secondary enrollment rates for boys and girls—near parity was reached in 2009/10. • Ugandans in the Diaspora have played a major role in educating their relatives in Uganda. There is an increased literacy rate since the 1990’s. This is primarily due to the money transfers to pay the school fees. Further, several Ugandans have sent money to renovate, fund or build new schools back home. • It is our role as Ugandans in the Diaspora to prove ourselves and sharpen our God-given metal – the brain. Why? It is very difficult to disenfranchise a literate Diaspora. The true success of a Diaspora Community is one that has intellectual power. This is what we term “indispensability.” This also means that we are very needed in the countries we have come to call home; therefore our being in these new homes is never to be questioned. • Healthcare: According to World Bank report, Uganda is off-track on particular health-related Millennium Development Goal (MDGs). In the early 2000s, the government initiated a comprehensive program of health reforms to improve effectiveness, responsiveness, and equity in the health care delivery system, including abolishing user fees in government units, improving management systems, decentralizing service delivery and promoting public–private partnerships. These reforms have helped to improve the sector performance and outcomes. They are credited as being pro-poor, especially by improving access and reducing cost. The Ugandan Diaspora has played a key role in the healthcare system of Uganda. This is primarily accomplished by money transfers to take care of the sick, pay hospital bills, send over the counter meds, vitamins, as well as other preventive remedies like ensure, vitamins and durable medical equipment to aid the sick and elderly back home. • Agriculture: Historically, Uganda enjoyed a strong and stable economy in the years preceding independence. Agriculture was the dominant activity. According to the World Bank, there is an initiative by the Agricultural Technology and Agribusiness Advisory Services (P109224) to increase agricultural productivity and commercialization of participating rural households by transforming and improving the performance of agricultural technology development and advisory service systems in Uganda; Further, Uganda has a comparative advantage in the trade of fruits, vegetables juices, grains and cereals, as compared to other countries in the region. The Ugandan Diaspora has the power to join in these efforts by utilizing their skill sets to ensure a succeful implementation and completion of this Project. Further, with individual contributions, the power to finance farming, starting at a small scale, from respective villages is enormous. • Tourism: Uganda – with its unique blend of savannah and forest creatures, its rare wealth of mountain and lake habitats – is simply dazzling. Uganda’s offers the most stunning scenery on the continent that includes sparkling lakes, lofty mountains, mysterious forests and game parks swarming with game. The private sector is encouraged to set up new tourist facilities in these locations bearing in mind the need to blend in with the contiguous scenery. Uganda’s eco-friendliness is attested to by the recent mushrooming of community-based eco-tourism projects at the grassroots level. •Human Capital: In 2012, Uganda ranked 161 of 187 countries on the Human Development Index compiled by the United Nations Development Programme (UNDP). Uganda is also experiencing a tremendous population growth. To reap the demographic dividend, Uganda must invest in fertility reduction, human capital formation, and productive employment creation. To reap the oil dividend, Uganda must maximize the social benefits through appropriate investment and prudent macroeconomic management, as well as transparency and management of expectations. There is an opportunity here for the Ugandan Diaspora. Especially medical doctors in the Diaspora have the power to increase services in the Planned Parenthood area to combat the pregnancy rates. The Ugandan Diaspora can play an important role in the economic development of the country. How Can We Capitalize on Our Achievements? Overstay Effect: Research shows diaspora attachment to relatives back home wanes the longer an immigrant stays abroad, thus leading to a decrease in remittances (Lillard and Willis 1997; Agarwal and Horowitz, 2002). The UBOS/Bank of Uganda (2012) chart below clearly proves this point. Most of the remittances (70%) are made by people who have stayed overseas for a period of 1 to 10 years. Remittances decrease to about 6% of all remitters for people who stay overseas for over 20 years! 1. Infrastructure: we are not putting so much money into developmental physical infrastructure as most remittances are made to household expenditures. 3. Encourage people to open dollar accounts. a) Dollar denominated account in Uganda could benefit the Ugandan Diaspora – for example, when we send money via money gram if we send it in dollar, they minimize the exchange rate. b) Encouraging Diaspora accounts to bolster local banks deposits that can be utilized to support the broad communities across Uganda to further their business development initiatives. c) DFCU Bank in Uganda has a Diaspora Bank where they give us loans, mortgages; work with local lenders in Uganda and the Diaspora can pay for the loans from here. a) Continuously strengthening our risk culture with the people we deal with back home, through behavior modification adoption to change. b) Driving understanding and conviction: We establish clear accountability at each level of communication, from our relatives to the business counterparts we deal with. c) Role-modeling and leading by example: We have the power to educate our people how to incorporate risk considerations explicitly in their own daily dealings, whether they are relatives, business counterparts or others. We can also encourage them to express their views however challenging they are, thus rewarding good decisions. d) We have the power of building skills and capabilities: Ongoing formal and informal training and communications sustain our shared understanding and strengthen our culture. 5. More Migration: Encourage more people immigrate to North America by sponsoring them on the green card lottery. Newer immigrants have more attachment to home and therefore encourage government to support and fund student exchange programs. 6. Mentorship: Advise new immigrants on the dos and don’ts in America so that they don’t repeat financial mistakes some of us made. This will maximize diaspora aggregate savings. 7. Influence US policy towards Africa. d) implement specific practices aimed at measuring the effectiveness of their efforts. Without a customized and comprehensive approach, the optimal growth of Diaspora investment and entrepreneurship will be stunted. e) together with other relevant ministries explore how highly-qualified experts in the Diaspora could be engaged without the need for physical relocation, to render services through virtual interaction. Mind-set: It will take a mind-set for the Ugandans in the Diaspora to realize that we have so much power to effect change in Uganda, by employing what we have learned outside our country. Let me also note that there are several Ugandans in the Diaspora who have exemplified themselves with remarkable achievements and accomplishments. For example, Derreck Kayongo is a Ugandan Top 10 CNN Hero of 2011, notable for his Global Soap Project, collecting partially used hotel soap and reprocessing it to save lives. Derrick is a good example of “Independent thinking” and a mind-set. Lillard, L. A., & Willis, R. J. (1997). Motives for intergenerational transfers: Evidence from Malaysia. Demography, 34(1), 115-134. Uganda Bureau of Statistics (UBOS) and Bank of Uganda (2012). Inward Personal Transfers 2012: Uganda: Personal Report 2012. Special thanks to the following people who contributed to the production of this presentation. Your prayers, efforts, advice, critique, data evaluation and validation added value. Rev. David Seremba; Bishop Bukenya; Mr. Johnson Seninde; Hon. Israel Mayengo; Dr. Buagu Musazi; Mr. Emmanuel Sabiiti; Mr. Derreck Kayongo; Mr. Ronnie Mayanja; Mrs. Mary Kawalya; Mrs. Brenda Kalema. With all due respect while you’ve covered almost everything that was included in the keynote address you failed to mention the prayers and other issues that were brought up during this event. This was mostly a prayer service but hardly a mention of some of the issues that were covered in prayer is brought up in your article. There were numerous religious leaders at this event and not a mention of what they prayed for is included here. Let us not kid our selves most Ugandans in the USA would be better off investing in the USA than investing in the “corruption infested” economy of Uganda. Uganda is a country that needs plenty of prayers and that was evident in most of the prayers conducted during this event. This sentiment and other anti-government views expressed during this event are clearly missing from your reporting. I hope and pray this is not by design. i appreciate your efforts in all you have researched, however if were to base our research on vivid examples on ground you will find that our per capita income is not yet above us$ 200. more so people who access food, clothing, medical and education are not yet 0.04% vi-res-vee our sitting population therefore it is from this point of view t hat you Ugandans in the diaspora develop confidence in your people in Uganda and make frequent visits with new innovations to your country. the story of joseph in the bible when he was taken to captivity no body even his brothers thought that time will come when them( betrayers) will succumb to drought and end up to joseph .